Marketing is continually changing and evolving, and nothing has propelled that more than the Internet. While the digital age has created a need for new skills, it has also enabled marketers to learn those skills with the click of a button, without going back to college. It’s possible to learn these skills through books, blog posts, podcasts and more, all with little to no cost commitment. There are also moderate to expensive online courses available. However, for those who might want a more structured or interactive learning experience without the cost, we have a few options for you to check out. 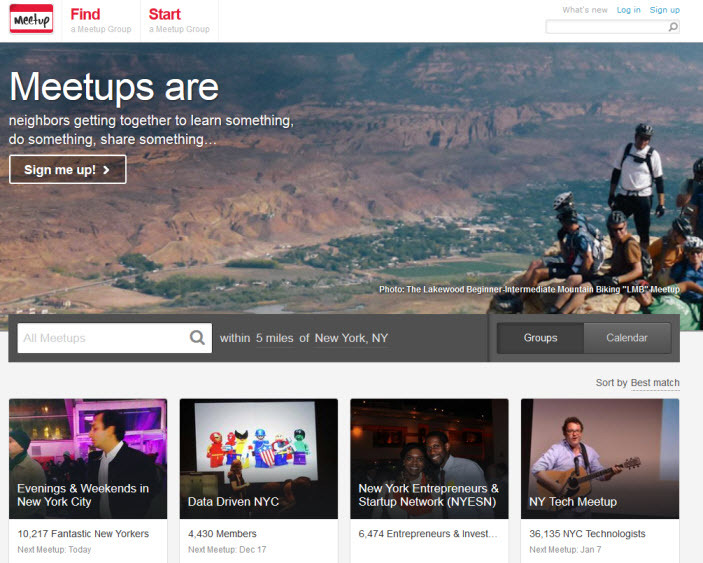 Read on to learn about five different sites that can help expand your skills in a variety of areas. Google offers free online courses to improve analytics skills in its Analytics Academy. It’s an at-your-own-pace format. You can watch lessons from Google’s experts, then test your knowledge through quizzes and practices exercises. They have also created a learning community with course forums so you can engage with other students and experts. After you’ve mastered the courses, you can earn Google Analytics Individual Qualification by taking the IQ test, which is now free of charge. It also offers courses on to make a website, an interactive website and a Rails Application, where students build their own versions of popular websites — Airbnb, Flipboard and Etsy. A personal brand is an expression of a value proposition. It is a powerful message that clearly articulates who you are, what you do and how you create value. When applied to social media, a personal brand creates a memorable first impression that entices visitors to connect with you. When using LinkedIn, a brand message should be the professional version of your value proposition. This brand messaging should be consistent throughout your profile and capture the attention of your visitors. 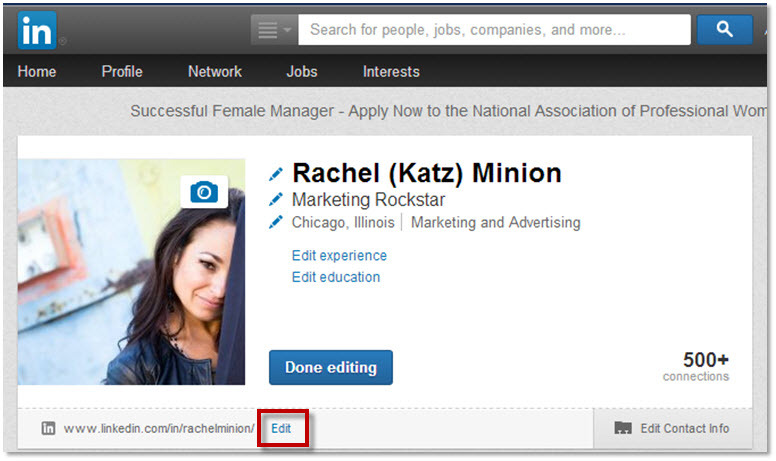 Here are some tips to establishing a personal brand on LinkedIn. 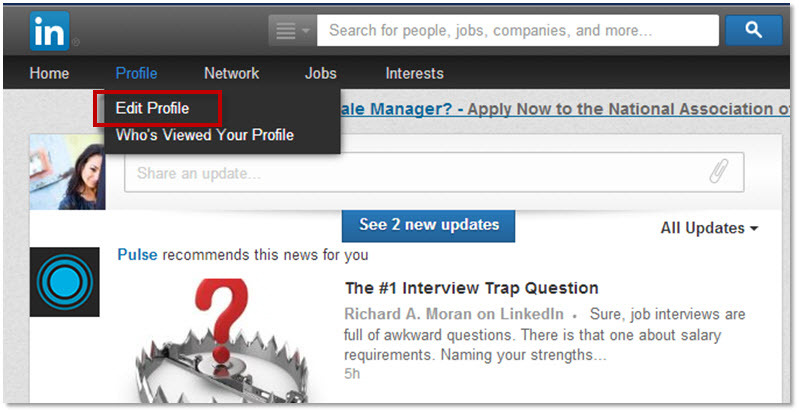 In LinkedIn, you have the ability to personalize your public profile URL. A personalized URL is essential to establishing your personal brand as it is not only friendlier from an SEO perspective, but it allows for people to find you more easily. Move your cursor over Profile at the top of the page and select Edit Profile. Find your current URL under your profile picture and click Edit. In the Your public profile URL box in the bottom right, click Customize your public profile URL. Enter your new custom URL in the text box. Your custom URL can have between five and 30 letters or numbers. Do not use spaces, symbols or special characters. You cannot change your URL more than three times in six months. If the URL you want isn’t available, don’t give up. Try adding numbers to the end of the URL or slightly changing the text. I’ve discovered firsthand in my role as Event Content Specialist at MarketingSherpa that creating content for your events can be a daunting task given all the factors that weigh in on making them a success. As we prepare for Web Optimization Summit in New York City held May 21-23, I decided to put together a few quick tips that can help you on your event planning journey. There’s a bit of a dilemma during the early stages of planning: How do you select the right speakers for your event? Oftentimes, while skimming through applications from speakers, a tempting brand name or title seems to pop out and yell “CHOOSE ME!” but realistically, not every brand or C-suite exec is going to be a good fit into your overall agenda. For example, if you book the CEO of Puppies Inc. for a keynote at Kitten World 2014, you may have a tough time ahead with your audience on the mismatch. When vetting the speaking applications, it’s important to make sure that their content applies to the overall event. Speakers that are a good fit will not only keep your audience engaged, but they will also deliver comfortably on stage, instead of working hard to adapt their content on the fly to fit the audience. For the case study sessions at our Summits, finding speakers that our audience can relate to is a cornerstone in our process. Relevance is even a part of our own value proposition, as we love to feature brand-side marketers as speakers for an audience of marketers who are also in the marketing trenches every day. Each speaker has his or her own style of presenting. Some people love to use a lot of slides and pictures, while others prefer a wall of text. I’ve seen beautiful PowerPoint decks with wonderful builds – however, I’ve also seen presentations that need a little improvement. To help keep the content at your events to a fixed standard, try encouraging speakers to use a written outline before any slides are built. This can help provide them with a framework for building out their presentation and it can also help identify any gaps in the content. Also, creating a PowerPoint (or whichever platform is your preference) template for speakers to use is a great way that event planners can also ensure brand standards are maintained. At Summits, with the exception of keynotes, our guest speakers are not professional speakers. They’re marketers who have discovered what works – and what has not worked – and they want to share their findings with their peers. As you would expect, being in front of a packed house to speak is not easy for everyone. To help our speakers feel a little more comfortable and confident in their public speaking skills, we use moderators. Moderators take the stage with our speakers and tee them up for success by walking with them through the challenges, key points and discoveries. By assigning speakers a moderator, he or she acts as a liaison for the speaker through the entire process. They work on the presentation together and build a relationship over the course of the project that really makes a big difference when it’s show time. At MarketingSherpa’s headquarters in Jacksonville, Fla., we’re lucky to have the One Spark festival right in our backyard. 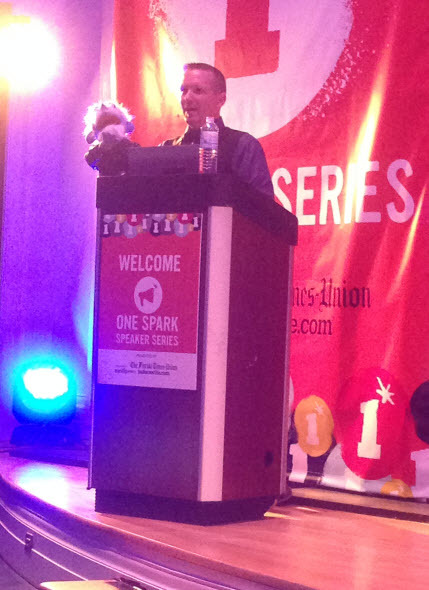 If you’re not familiar with the event, One Spark is a large crowdfunding festival that draws entrepreneurs, artists, inventors and amazing food trucks together for five days of elevator pitching to the masses. The festival lasts for five days and is held in the heart of downtown Jacksonville. According to the One Spark website, this year’s event drew more than 260,000 attendees and generated $3.25 million in capital investments for project creators. Not too shabby for a festival only in its second year. The event also had a great speaker series that I had the privilege to attend where thought leaders in the crowdfunding space shared their ideas on marketing and design. In today’s post, I wanted to share a few snippets of those presentations to give you an idea of how some experts are approaching marketing concepts in an emerging industry. Technology has changed the way that marketers engage with their customers, and as a result, how you deliver your value proposition has to adjust, too. Ross Unger, Experience Design Director, GE Capital Americas, explained how ideas and their value evolves, using Jim Henson, creator of the Muppets, as an example. Ideas, according to Ross, are constantly changing and evolving. Henson’s idea for loveable creatures made of foam started from a high school project, and moved to commercials before eventually evolving further into movies, toys and attractions at Disney theme parks. The Muppets had flexibility to grow as their audiences changed, but the idea of Kermit remained the consistent. If marketing is the “pen” in communications with customers, then design is the “paintbrush.” The trick, according to Jeff Barlow, Creative Manager, Starbucks Global Creative, to painting amazing pictures for your customers is to keep your work interesting. “You don’t do anything really amazing unless some people love it and some people hate it,” Jeff said. Jeff used a project based on blues music as an example. He had his team create a design campaign based on the music genre. To do it, Jeff had them dig deep. Instead of just creating designs based on what came to mind when they envisioned the phrase “blues music,” they instead took time first to research the history of the blues. The team covered the lifestyles of famous artists and popular venues, then putting it all together into one piece, pouring heart and soul into a single design they felt encompassed the full weight of the subject. Jeff also touched on the importance of drawing inspiration from everywhere – not just for the clock. Jeff admitted it was nothing that he could sell, but it was something he imagined and it kept the creative juices flowing. He even had his team make a visual design around a fortune in a fortune cookie. It was a challenge that broke up a work day for his team and exercised their creative minds. Having assignments outside of deadlines, and having the courage to “always explore” keeps things fresh and interesting. Marketing Management: Can you use story in your hiring process? Content marketing comes down to a great story. It’s the story of your product, sure, but more than that, it’s the story of how your audience can achieve their dreams and overcome their pain points. Your product just plays a supporting role. Can you use story, and essentially content, for recruiting and HR as well? You can show how your company can play a supporting role in helping the right candidate achieve his or her hopes and dreams. High-performing marketing requires a high-performing team, so recruiting is essential. By using a story, you’re attracting and hiring people that are already bought into the company’s vision and ready to be part of the team. I’ve traditionally used that story in the written format, but as we’re now hiring for a Visual Storyteller, also known as Content Presentation Specialist, I tried a more visual format with the help wanted ad, so to speak. How about you? Have you experimented with using story in your hiring process? 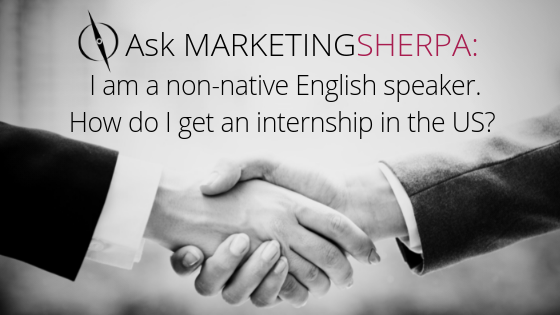 Do you approach hiring as another content marketing, or even general marketing, campaign? I’d love to hear your tips and techniques as well. Communication is the lost currency of business. When thorough and effective communication is not present in business, everything else seems a little off. I’m sure we have all run into situations where we thought something was taken care of, but the memo didn’t get through clearly, and then you became angry at Joe in Accounting for not compiling those numbers for the important meeting with the VP. The scenarios are endless and the consequences can be devastating, all from one communication mishap. Here are a few tips that have improved the communication within my team that you can use to aid your own communication efforts. I see companies operate in silos much too often. Departments only two feet away from each other have zero idea what the other team is working on. Closed lines of communication are a missed opportunity for sharing transferable discoveries that can potentially achieve commingled goals. For example, if your team is working on a project that you think could have discoveries or beneficial concepts that may apply to a different project elsewhere in your organization, you should try to share that information whenever possible. A quick summary of your team’s projects distributed in a weekly update email or during a peer review session can help build good communication by spreading vital information companywide. Ultimately, it takes a proactive effort to share information with other departments in order to help eliminate the poor communication that often results when groups work in a vacuum. I understand this isn’t a new concept, but we’ve all attended meetings that were pointless and a waste of valuable time. Too often, objectives aren’t set and leaders aren’t identified. Set an agenda, and send it out to participants. If you are running a conference call, make sure to send the agenda to attendees at least a day in advance for review to ensure you don’t miss anything. The agenda should always include a spot for a meeting objective and room for you to include the attendees and their roles. Keep the meeting to the agenda so topics don’t get too off track, which leads to more wasted time. Delegate a note taker. Probably the most crucial role in a meeting, this person helps to capture the most important points and action items and sends it as takeaways to all attendees for reference. Marketers invest a lot of time and energy to build strong customer relationships. Understandably, that leaves little time for personal brand building or networking. But, let’s face it. With consumer trust remaining deeply connected to people you know personally, the need to build your personal brand and grow new opportunities through networking is more important than ever. Here are three tips to help you approach networking and personal brand building. You can use these tips to get started, or to rethink your networking strategy. Sure, there are plenty of people out there with a Twitter account, a Facebook page and a LinkedIn profile, but how are you using them to network? Consider that a message resonating in 140 characters with your Twitter followers may not even come close to being relevant for an audience on Instagram, which focuses on images. If you first understand how to communicate effectively in these individual platforms, then you’ve crossed a big barrier to growing and cultivating audiences among them. Networking and personal brand building on social media starts with a conscious effort on your part to create a smart digital footprint around your personal brand that uses social media effectively. Reconnecting with old friends can be a great way to catch up on the times. You can also use the opportunity to evaluate how their skills can help your audience. The big idea here is what I call recommendation reciprocity. Part of building an audience around your personal brand means you have something of value to offer. What better way to do that than by recommending someone you know and trust who can help with their needs. Joining groups of people who have similar aspirations can open up new networks, but the trick here is to be helpful. Groups can offer a wide range of expertise, but they also suffer from shortfalls in knowledge areas and hopefully, that’s where you come in. Offering your expertise or recommending someone who can help will make a big difference in meeting your networking goals versus sitting on the sidelines and treating groups as pseudo news feeds. With LinkedIn and Facebook offering huge online communities, and sites like Meetup offering both online and offline groups, there are plenty of choices to fit your lifestyle. Don’t be afraid to start a new group if you’re not finding groups out there that fit your needs. Starting a group and actively managing it is a great way to fast track into new circles, not just as a member, but as leading voice. 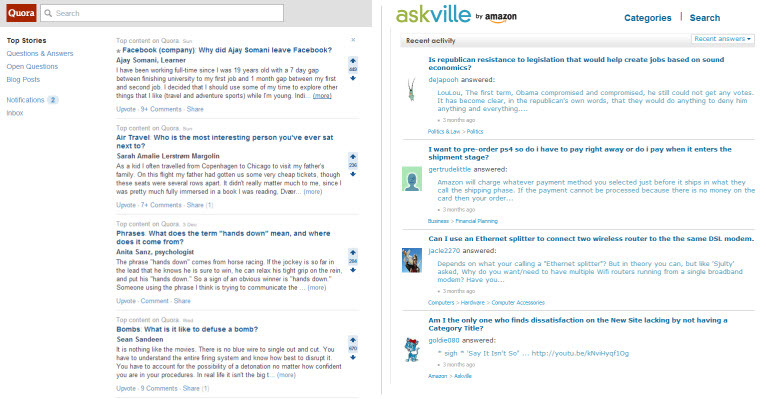 An additional tactic I recommend for being helpful in the social realm is using Q-and-A sites like Quora or Amazon’s Askville to answer questions posted by others who could benefit from your insights. 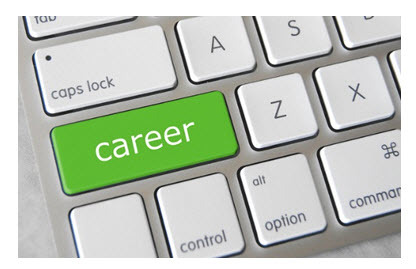 There is no magic bullet for building a personal brand or networking effectively. It’s a lot of hard work and long hours. It takes consistency and dedication to reach your goals, but when has anything really worth doing ever been easy? Feel free to share some of your personal branding or networking tips for success in the comments below. At some point in your marketing career, you’ve had a moment of artificial marketing brilliance. It was a moment where you suspected your customers might respond better to a shorter form or a bigger and more colorful call-to-action button inviting them to a unique experience. You might have even had the sneaking suspicion that changing some of the value copy on your homepage would boost sales of your product or service because no other competitor can boast figures close to your product’s success rate. Afterwards, you kick back to watch the ROI roll in. Your brilliant idea bombs in glorious fashion and you’re left scratching your head. If your marketing is driven by intuition, at some point, you are going to fail and it’s one of the best things that can happen for your customers and your career. Read on to find out why. 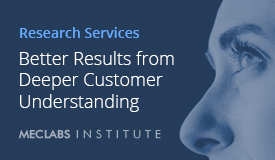 Many marketers use gut instinct in hopes of delivering optimal results, but when they fall short of expected results, those marketers never fully understand why. But, if we use the hypothetical situation above, some clues emerge that can help us understand what leads to failure. 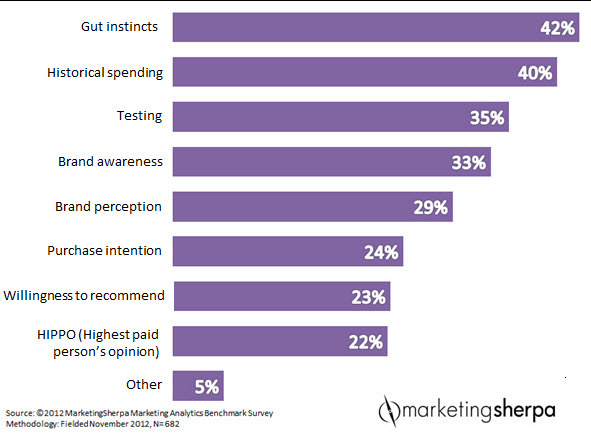 Nearly half (42%) responded with gut instincts, followed by historical spending trends. Now, I’m not saying there’s anything wrong with these resources because, let’s face it, it’s easier to borrow from a seemingly good idea than it is to create a new one from scratch. The inherent problem is not where you get an idea. The problem is how you intend to use it. This is the point at which many marketing campaigns were doomed to underperform because ideas untested are always at the mercy of uncertainty. Your gut failed you … now what? One of the best career moves you can make is to move away from gut instinct marketing and begin using an evidence-based approach that is methodical and systematic. 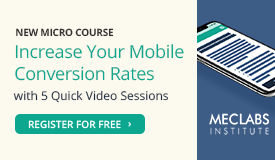 Chances are, you’re going to have some questions after your first radical redesign where shorter landing pages resulted in a 10% decrease in clickthrough. Did the larger hero image take away from the copy? Was the award for customer satisfaction from 2004 recent enough to provide credibility? What turned the audience away? You’ll also have questions if your redesign brought you a 5% lift in clickthrough. You might even be pretty content and let things rest, even if you could do better. 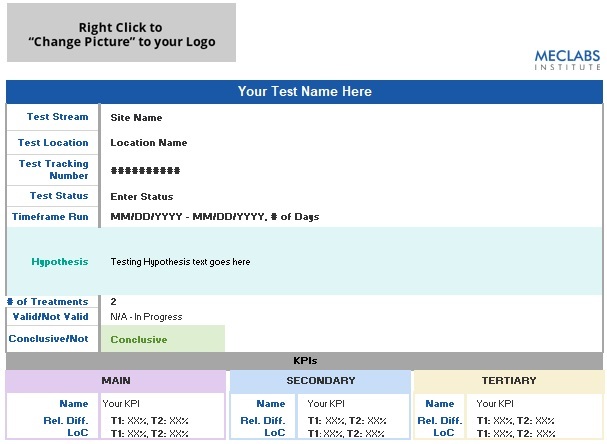 Those strokes of “marketing brilliance” are coming from a different source – online testing results that can be used to build a customer knowledge base. Did your customers like your new vivid red button? Did they respond well to reading you were the only company in your field to offer one-on-one tutorials with an expert? If you changed the eye-path on the page, could you have achieved a 10% lift? 20%? The inevitable question – Why? You can try to isolate the factors that seemingly impacted your audience, or you can test them and measure their performance to know for sure. And then, it’s time for more testing. Both the small gains and big flops lead you to learning more about your customers, a path riddled with failure, success and discovery, that no gut instinct on the planet can come close to. There is an inherent paradox in the marketing and media industries. We need creative people, yet we need corporate structure. Creative people need freedom to thrive and yet, we work tirelessly to bang square pegs into round holes until the hammer is busted, the peg becomes warped and the creative talent is defeated. Free to roam across the Great Plains as the wind whipped through our hair. When lightning would strike in the distance, spooking the herd, it was up to us, the mighty stallions, to chase them down and lead them to safety. In our corporate environment, it can feel as if our creative spark is only a shadow of its former self. It has been reduced to the old bag of bones nag you see tied to a revolving wheel at the county fair for the kids to ride. But even then, if you look deep enough in our eyes, it’s still there. That wild spark. Now that I have the distinct privileges of running my own team of creatives, and interviewing some of the most creative and effective minds in marketing, I look at our stable of talent this way – it’s on us to make sure they never lose that wild spark. If you’re working with a team of creatives, either at an agency or on the client side, here are a few suggestions I propose to challenge you to help keep your team’s creative spark alive and well. The fastest way to kill your team’s creative output is with a stack of invites to meetings they don’t need attend. I try to keep my team out of as many meetings as possible. If a meeting isn’t avoidable for your team, then try to sacrifice your own time to protect theirs. Take the meeting on the chin yourself, and then go back and fill your team in on the two minutes of relevant information that applied to them. The only thing that screams “corporate” more than meetings is the mass-copied email, so I try to avoid sending them if possible. A great way I’ve discovered to do this is through industry awards. The creativity that was a linchpin to their success was often just what I needed to keep my spark alive and recommit to coming up with better work. I’m on the other side of things now, judging awards. For example, we just launched MarketingSherpa Email Awards 2014. There’s no entry fee, so there is no excuse not to tell your team to enter. 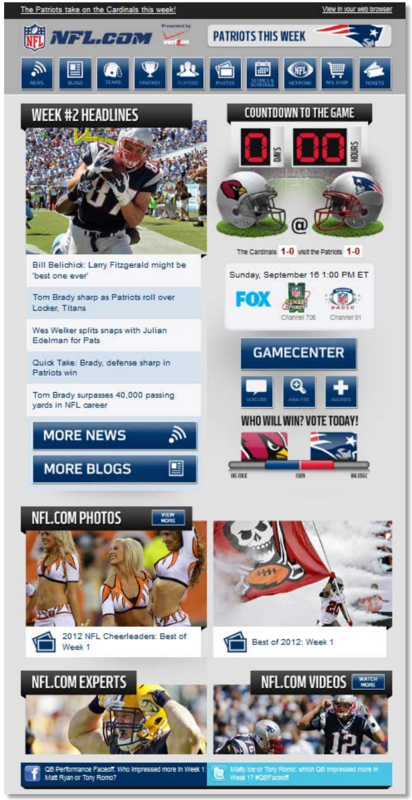 For example, the Best in Show winner from Email Awards 2013, NFL.com, had some really innovative features in its emails, like “Countdown to the Game” clocks and a “Who Will Win? Vote Today!” dynamically updated poll. It’s creative ideas like these from marketers across a wide range of companies that continue to inspire me. I think there’s a false impression that creatives are art snobs who only care about aesthetic appeal. We have, after all, decided to work in a corporate environment, even though it chafes. Let them see the fruit of their labor. Earlier in my career, writing an ad that was successful in The Wall Street Journal for six months versus the previous ad that could only pull leads for two weeks was a huge morale booster. Now, working more in the digital media space, I love receiving feedback through social media (I’m @DanielBurstein if you’d like to tell me what you think of this post) as well as A/B testing, even when the more creative ideas lose. At the end of the day, we know results matter. After all, a man’s gotta eat. I know when I’m judging the Email Awards, results will be at the top of my mind. I’m sure they are important to you as well as you manage your creative teams and agency relationships.